Purim is coming! I was off work this week due to midwinter vacation and decided to get a head start experimenting on my hamantaschen. My son Dovid (who is dressing up as Dovid HaMelech this year) helped me to create a great flavor combo! He absolutely loves all things peanut butter, and I love cookie butter. 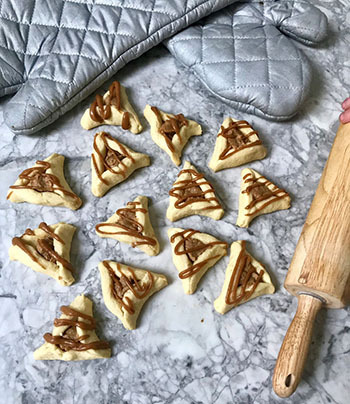 We put them together to create an amazing filling for these delicious hamantaschen. I also finally figured out how to get the hamantaschen so perfect looking. After forming the triangles and pinching them tight, stick them in the freezer for 10-15 minutes before baking. This will ensure the edges stay sealed and do not open while baking. The gorgeous glaze makes these hamantaschen look professional. Enjoy and have a freilichin Purim! In a big bowl, whisk the eggs, sugar, oil, and almond milk. Add the flour, baking powder, and salt until a smooth dough is formed. Refrigerate the dough for 30 minutes. Meanwhile, preheat the oven to 350°F. Make the filling by combining the cookie butter and peanut butter. If it’s too thick, add some almond milk to thin it out to the desired texture. Roll the dough out thinly on a floured surface and cut circle shapes using an upside-down glass. Put a spoonful of filling on each circle and pinch the dough tight into a triangular shape. Freeze the cookies for 15 minutes, and then stick into the preheated oven. Bake for 15 minutes, or until golden brown. Wait for the cookies to cool completely before drizzling them with the glaze. In a Styrofoam cup, pour some boiling water over cookie butter and mix until you get a glaze-like consistently. Pour the mixture into a Ziploc bag and snip off the bottom edge. Pipe the glaze over the hamantaschen. These freeze well and taste delicious! Enjoy!